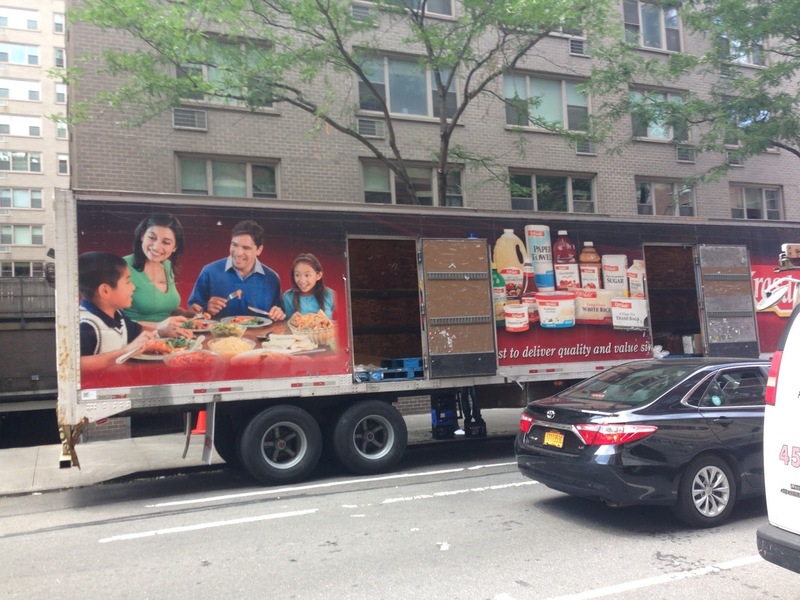 Here's a quick photo of another Gristedes in Manhattan. For some unknown reason, I saved this file on my computer as just "The Other Gristedes". Looks like it's actually at 1343 Lexington Ave, Manhattan, NY. We're back in Elizabeth for yet another store here. Maybe you remember way back when I posted CitiGrocer, also in Elizabeth. CitiGrocer is owned by Supremo Foodmarket and is the newest Supremo. Ironically, the oldest Supremo is also here in Elizabeth, store #1 on Broad Street in Elizabeth. 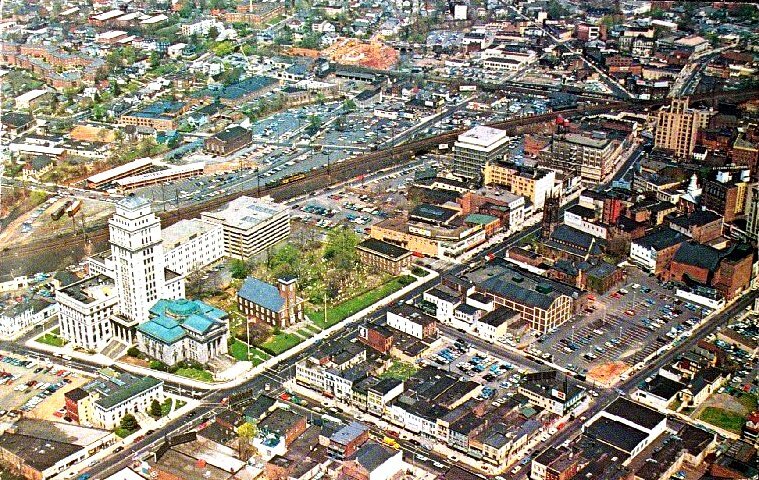 In this aerial photo from 1970, you can see a little of the old A&P on Broad Street in the bottom left corner. Notice how it faces Broad St; now the store faces the parking lot and Pearl St. A&P probably remodeled the store some time in the 1980s, and changed where its entrance was. 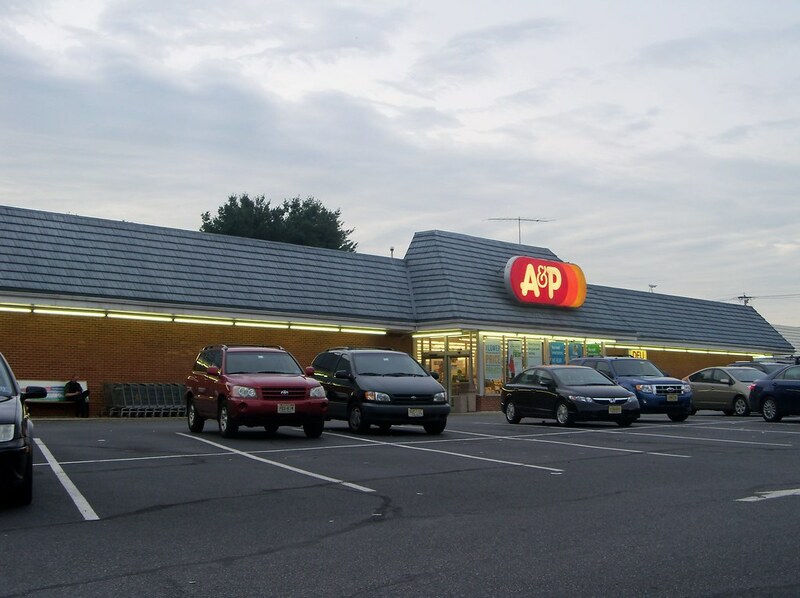 A&P closed between 1993 and 1997, with Supremo opening in '97. In the beginning, I don't think Supremo did any substantial renovations, doing a somewhat major renovation ca. 2004 and another larger one ca. 2010. 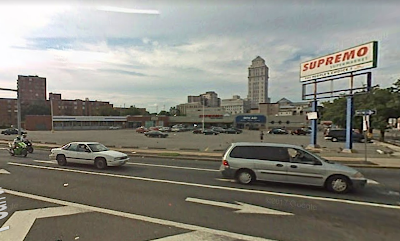 This Google Maps street view from 2007 shows how the store previously looked...pretty depressing. The more recent renovation brought a much-needed redo of the entire plaza including repaving the parking lot. The Union County Courthouse in the background makes the store conducive to great photos, especially when the sky is nice. I doubt this sign is original from A&P, but I don't know. 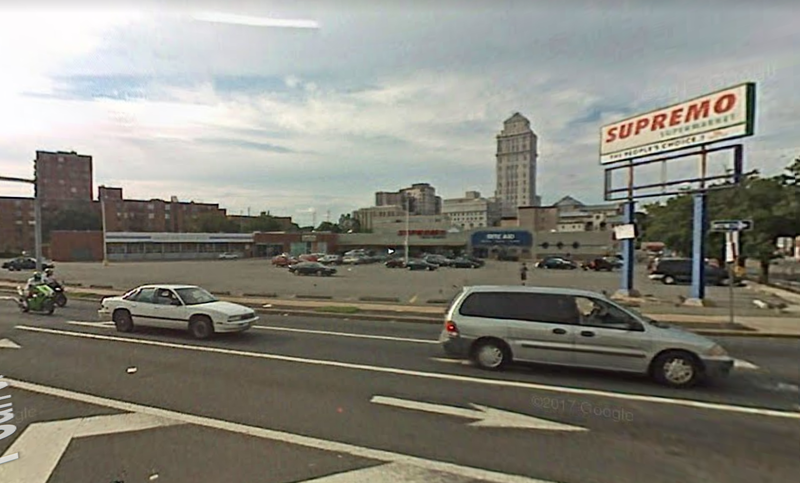 The tall building in the background is the Union County Courthouse, which is strategically positioned to be visible from down Elizabeth Avenue, a cross street. 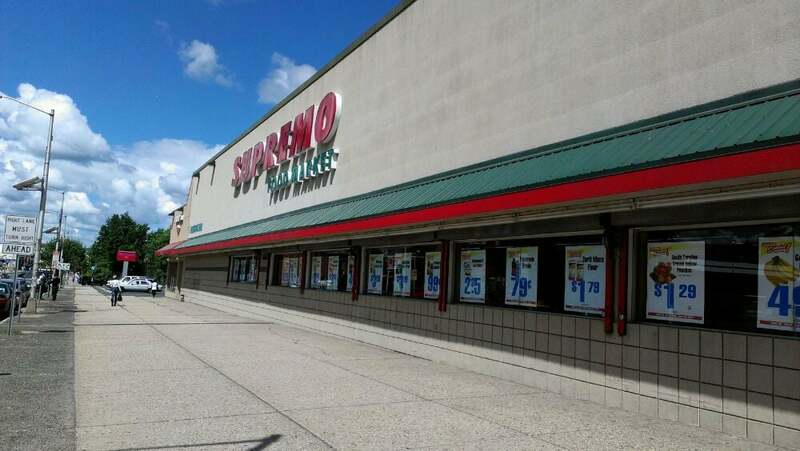 The store, which backs up to the Elizabeth River, also has a Supremo sign on the back. Interesting that this sign doesn't use the regular Supremo branding, like what's on the front. Also interesting that the Supremo actually occupies the white part of the building, and the grey part is a Rite Aid. 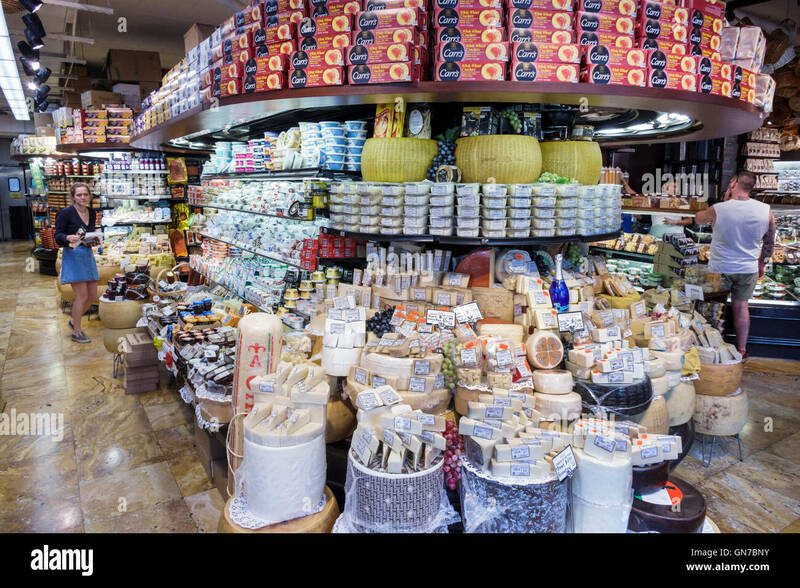 Heading in, you find the same layout as in most Supremos and CitiGrocer. Produce is the first extra-wide aisle, with meat and seafood at the back of the first aisle; dairy along the back wall; frozen in the last aisle; deli in the front corner opposite the entrance. You enter against the far wall. Security is to the right here and customer service is at the opposite end of the front-end. The floors are also really nice. 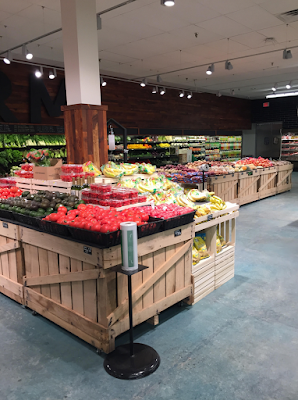 Like many smaller stores, the produce shelves have grocery and bulk shelving underneath. Packaged meats are at the back of the produce aisle. 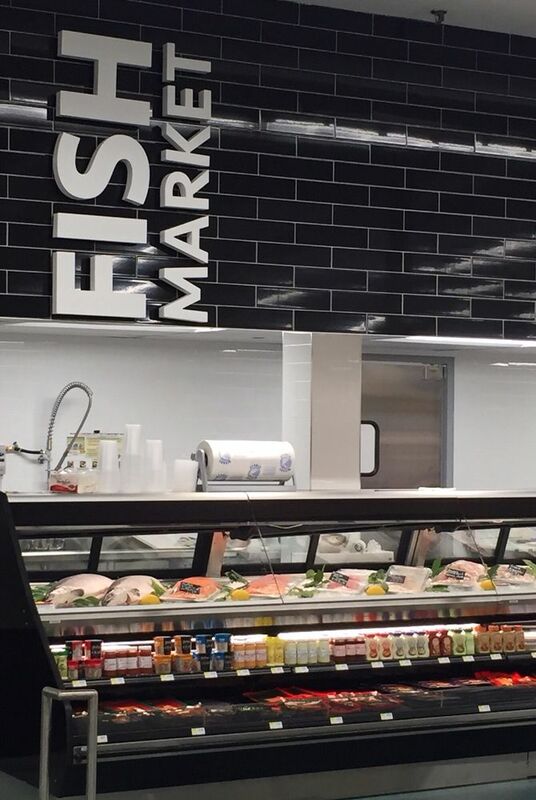 Looking from the end of produce towards butcher and seafood. Although this decor package was developed for Supremo, other stores use it including the Gala Fresh Farms on St. Marks Ave in Brooklyn. Supremo is a local chain with a dozen locations in New Jersey and Pennsylvania. They were previously a member of the White Rose cooperative, but in the White Rose bankruptcy of 2014 they split and became an independent operator. They use the Essential Everyday and Wild Harvest brands from Supervalu, and occasionally you'll find a random Krasdale or Parade product on the shelves. The dark "wood" floors give the store a very warm feeling. Both of the other Supremos I've been to (Allentown and Irvington) have the same dark floors. Very clean and clutter-free grocery aisles. I love the effect of the "wood" flooring and the backlit awnings along the top of the shelving. Two different shots of the same aisle on different days. Looking back towards seafood and meat from dairy. I don't know how many, if any, of the store's fixtures are left over from A&P. I also have no idea what A&P's layout was. There were a few random facings of Parade margarine mixed in with the Essential Everyday products here. Don't ask me why! 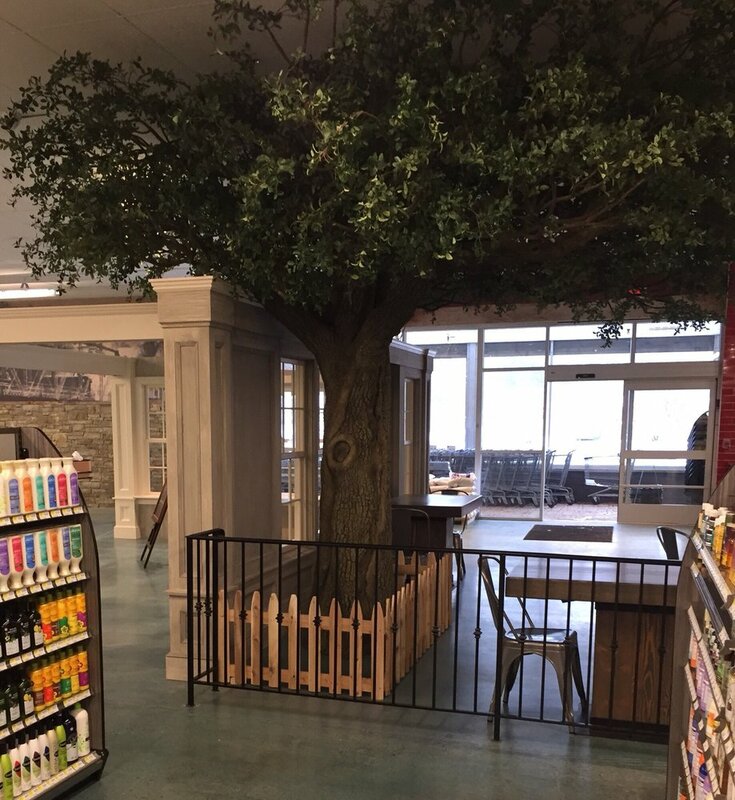 This alcove in the front corner contains the bread (no in-store bakery) and the deli. There used to be a hot food counter in the corner as well. Standard deli counter, plus the Deli Plans that allow customers to buy in bulk to save money with a set plan. 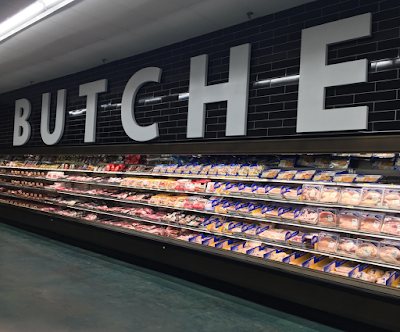 Supremo also offers Meat Plans, as do many other stores, particularly in lower-income areas. Former hot food counter covered by soda displays. While Supremo is typically known for its long lines, the store was not that busy the day I visited and the lines were moving quite well. Really nice custom-designed checkout lights to match the decor on the walls. Another competitor of the Ideal Marketplace and Fairway in Chelsea, Manhattan, NYC is this Gristedes Megastore, only marginally larger than Ideal and about the size of Fairway. Gristedes is, however, far more expensive than Ideal or Fairway. 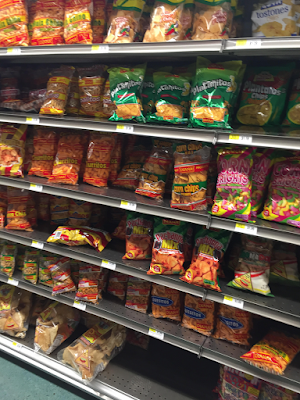 Gristedes is a wholesale customer of Wakefern Food Corp and sells the ShopRite storebrand. I don't see how it's still hanging in there as it's generally agreed to be in the bottom five supermarkets of New York City. Today's (unexpected!) post is somewhere between a Look Inside and a full tour. 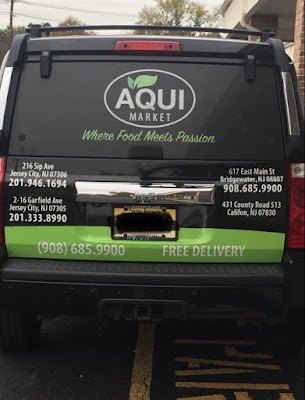 As we reported on Facebook a while back, Aquí Market has taken over the former A&P in the affluent rural/suburban town of Califon, NJ. Recently, I have been in touch with a local resident, Gerry K., who has a few photos of the new store. (According to him, this blog was one of the few online sources of information about Aquí. Looking back at my previous Aquí posts, I think I was a little harsh on them! This also explains why I have over 1300 views on that post alone.) All the photos here are his. Let's have a look! Notice that this is actually a slightly different logo from what's used on the JC and Bridgewater stores. Gerry's Yelp review points out the store's Outpost name, which he thinks might suggest the owners are interested in opening other Outposts. 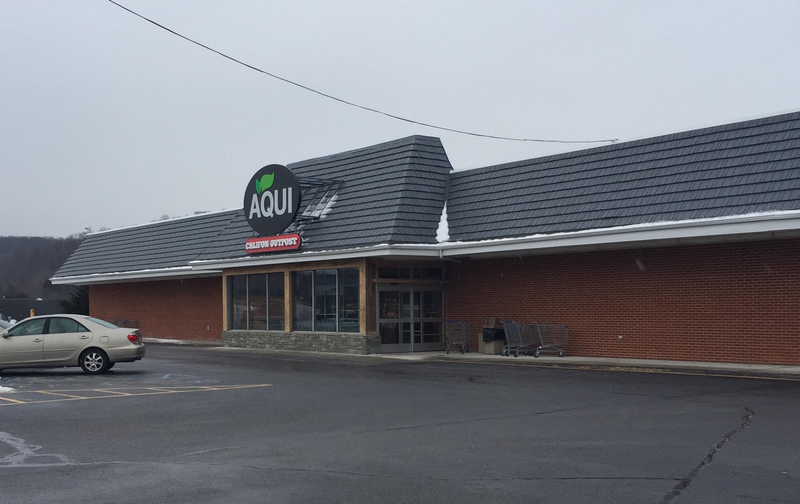 Aquí has maintained the basic structure and appearance of the facade, while adding the rustic wood and stone touches, which I personally like. 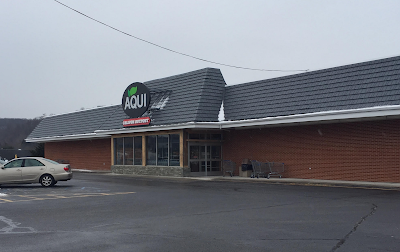 Heading in, we see that Aquí has totally redone the former A&P with a very modern design. I don't know the layout at all here, so maybe some readers will fill us in. 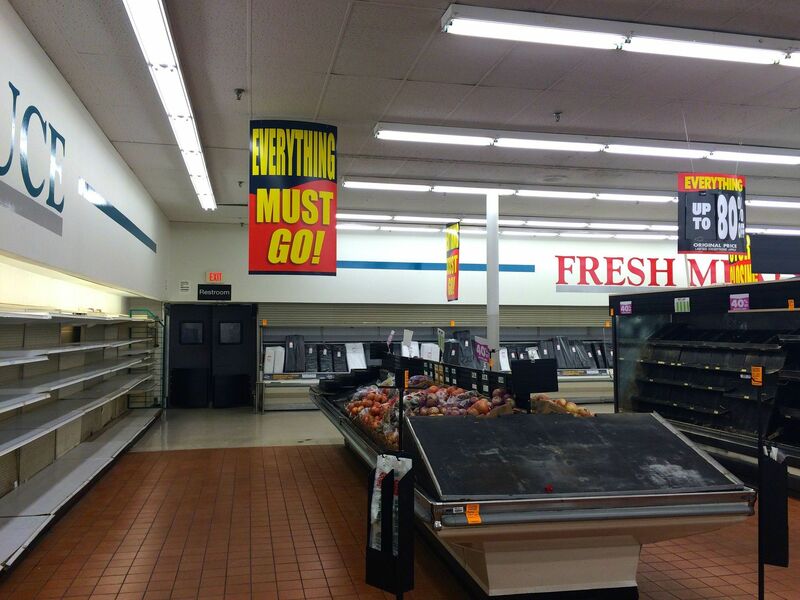 And just for comparison, here's what the produce department looked like before. Meat continues along the back wall with great oversized signage on really upscale black subway tiles. Once again, NJ.com provides us with a "before" photo. What a difference! ...complete with its own fake tree. And look at that fancy HABA! Most Aquí stores don't even sell HABA! Deli and coffee are near the entrance, with seating immediately in front of the entrance. Bakery coming soon next to the deli. Hard to tell whether they'll bake in-store. Here we see the deli is just inside the entrance along the front wall. I wonder if this department will get signage once the store is finished. 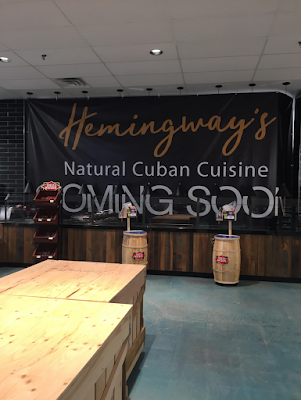 True to Aquí's Latin roots, they will be offering prepared Cuban food in the store. Currently the Califon Outpost is operating on a limited schedule, from noon to 8PM daily, until the store is fully set up. There are now more interior photos of the store on Google Maps. Interestingly, this store does not appear to sell Parade products, which the other locations do. I'm not sure if this is true, though. Once again, if anyone can confirm, that would be great! 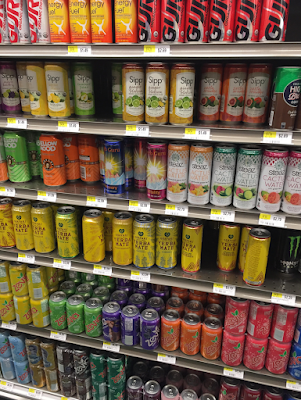 Gerry reports that the product selection tends to lean towards the upscale, small brands, while mixing in a good selection of standard and Latin grocery items. However, unlike Aquí's other locations, Califon is not a predominantly Hispanic area. About 1.3% of Califon's population is Hispanic, or about 14 people! 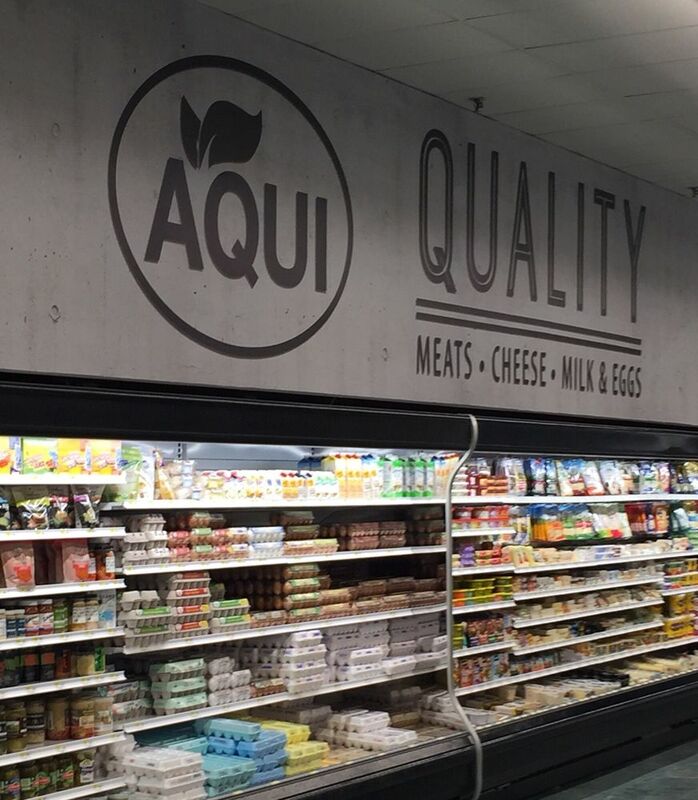 So in this store, Aquí is focusing on mostly upscale (natural/organic/trendy) foods, something we haven't seen in their other locations. This newer photo shows that some items are now being put on sale (see below). It's unclear whether the location offers delivery, as the others do, but the new location is included on their delivery van, pictured here at the Bridgewater location. In Gerry's words, "'Where Food Meets Passion' sounds like focus group tested marketing speak to me." 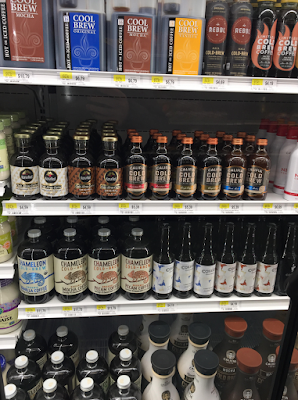 "So far the biggest complaint in town are the prices and that’s because 1- seems like half the products they carry are higher end brands you might find in Kings or Fresh Market or maybe nowhere else in the burbs (this is an area with a lot of money) and 2 - nothing is on sale yet, so of the regular brands, everything is top retail price. Cracker Barrel cheese $5.29, Ocean Spray cran juice $4.99 [corrected], gallon milk 4.99, Alden’s Organic Ice Cream $9.99. However, most people are not complaining. They’re thrilled. "Manager/owner says they will be doing a weekly flyer with discounts. No shoppers card though. But the next closest grocery store is ShopRite in Clinton 15-20 minutes away so not much competition. 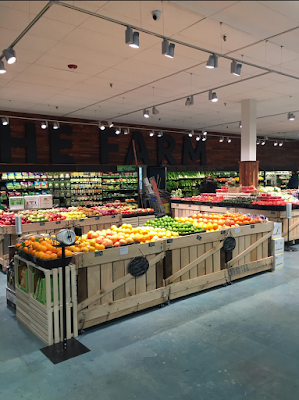 "Produce and meat are already competitive in price with other stores and very high quality. Fresh Portuguese rolls 3 for $1. 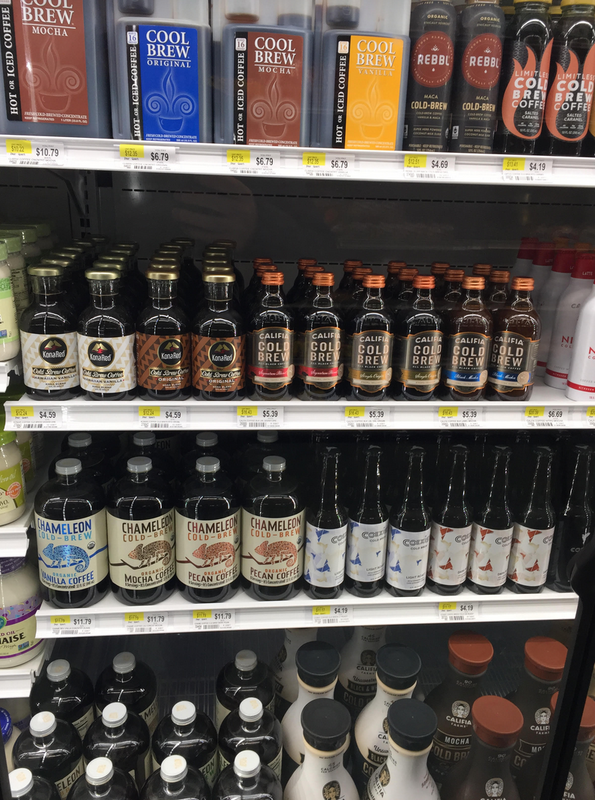 Deli carries Dietz and Watson, Boars Head, and Thumanns. Lots of organic everything." 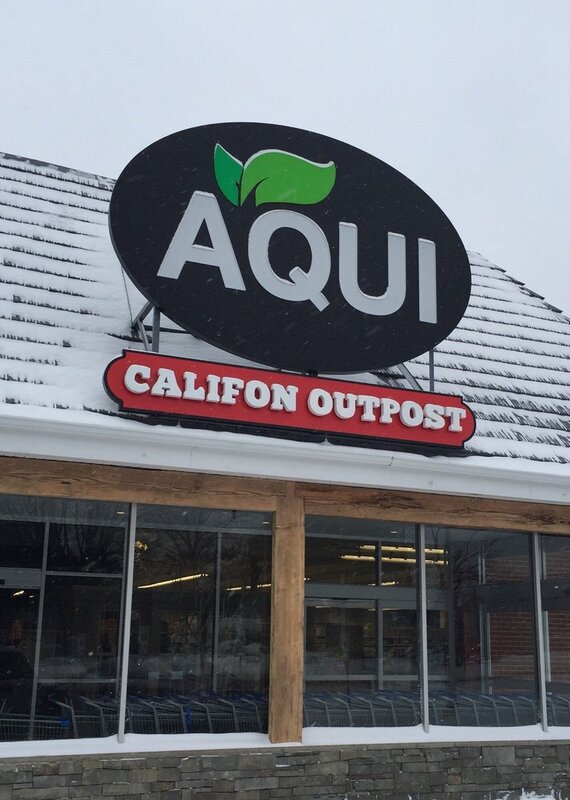 Sounds like Aquí Califon Outpost is off to a very strong start, and definitely welcomed by its customers. They certainly have a beautiful facility and a strong product selection, it looks like. Does anyone have any input? Special thanks to Gerry K. for his photos and information, and to all of the residents of Califon who read this blog for Aquí info!